Hand-picked in mid-September to the beginning of October, each oil is produced from a single variety of olive grown on the Mandranova farm and crushed immediately after harvest – an excellent way to sample the true flavors of Sicily. CORATINA: Green with slight golden hues, its aroma is characterized by elegant vegetal notes of artichoke and chicory with hints of almond and rosemary. Its taste is powerful and robust yet balanced in delightful bitterness and pungency. CERASUOLA: Dark green in color, the oil is medium fruity with flavors of olive, almond and marjoram and has a pleasantly bitter and peppery aftertaste. Use on legumes, vegetable soups, red meats and mature cheeses. GIARRAFFA: Light green in color, the oil is delicately fruity with a flavor of dried fruits, basil and lettuce and has a light bitter and peppery aftertaste. 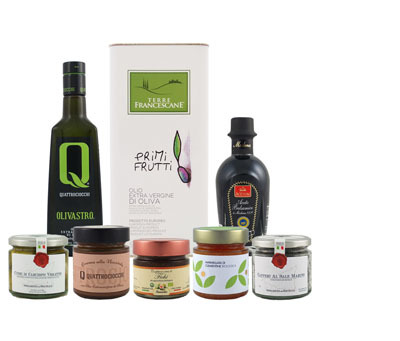 Use on fish courses, carpaccio, light green salads, white meat, fresh cheeses and cakes. NOCELLARA: Green with golden hues, the oil is wonderfully fruity with a pleasant fragrance of freshly cut grass, artichokes and tomatoes. Its spicy flavor is well-balanced with a delightful bitterness. Use on tuna fish, vegetables au gratin, mollusks, stewed fish, grilled meat and mature cheeses. Combining traditional knowledge with modern methods, Mandranova products are not only of excellent quality, but are true expressions of the land and people of Sicily. The farm, owned and operated by the dynamic husband and wife team, Giuseppe and Silvia, is situated on a hill just a few miles from the Southern sea in a green oasis where select olive trees, some over one hundred years old, grow to witness the labor of the area's ancestors. Here they produce the finest quality monocultivar extra virgin olive oils that are expressions of their land, sun and terrior. The olives are harvested by hand from mid-September to October and immediately crushed in their own on-site mill. An accurate control process of each stage of production yields a product of the highest quality, continually recognized by prestigious awards throughout Italy and across the globe. Pressed from 100% Moraiolo olives of Umbria. Pressed from native Frantoio, Leccino, and Moraiolo olives of Umbria.